Chicken Dopiaza recipe by Sajida at DesiRecipes.com. Mustard oil/Corn oil 1 cup. Grind all the spices. Cut the chicken in pieces. Heat oil in a pan & put all the spices along with onions, ginger /garlic with salt & keep on stirring adding little water to keep color red. Then add chicken & yogurt, add a little water & cover on a slow fire. Keep on stirring every now & then. When the chicken is tender & water evaporates, sprinkle coriander leaves , black pepper & cumin seeds . The same recipe is suitable for mutton. 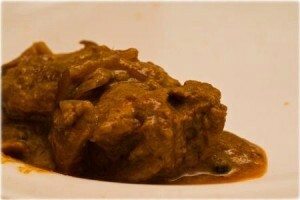 Dear Sghaznavi, this dish requires just a little gravy to cover the meat and not too watery.